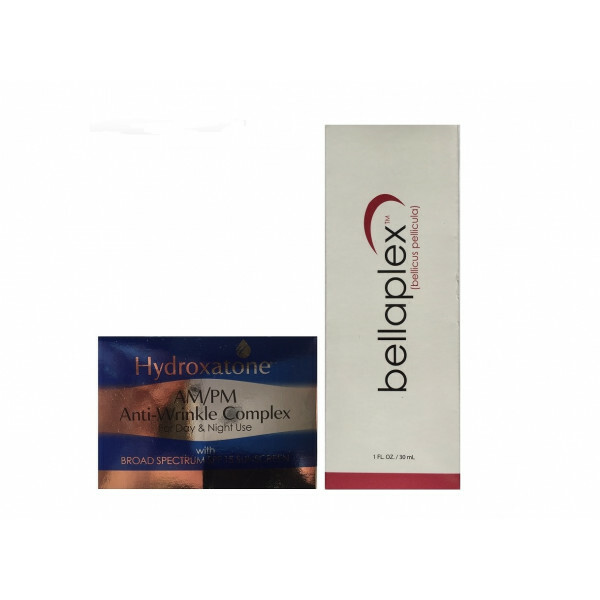 New and Sealed BELLAPLEX (Bellicus Pellicula) and Hydroxatone AM/PM Anti-Wrinkle Cream: The 2 Piece Set that is taking the world by storm!!! Bellaplex claims to have scientifically advanced wrinkle reduction and prevention properties. They use four advanced wrinkle fighting ingredients that they claim will help you to get rid of all types of wrinkles. Bellaplex works by stimulating collagen production, decreasing facial muscle contractions, providing fresh collage to the skin and hydrating skin in the process. Matrixyl 3000 is designed to promote collagen production in the skin, Argireline is a peptide complex designed to decrease facial muscle contractions, Collagen is a substance that is used to improve skin tone and firmness, Hyaluronic acid is an ingredient that retains water and hydrates skin. All four ingredients actively work to restore the youth of an individuals skin. The second half of this set is the Hydroxatone AM/PM Anti-Wrinkle Complex. This all day cream offers a unique formula that is proven to help reduce the appearance of a wide range of wrinkles. This safe and effective formula is a more natural alternative to other harsher age-fighting items. This effective cream contains Argireline, Matrixul 3000 and Hyaluronic Acid.